The Census Bureau recently released a web application that provides commuter mode share information (the percentage of travelers or number of trips using a particular type of transportation), including bicycle and walking commuting numbers, for each state, county, and census tract in the country. Not surprisingly, the map shows that bicycling in the Washington metro area is concentrated in the neighborhoods surrounding downtown D.C., Capitol Hill, and North Arlington. 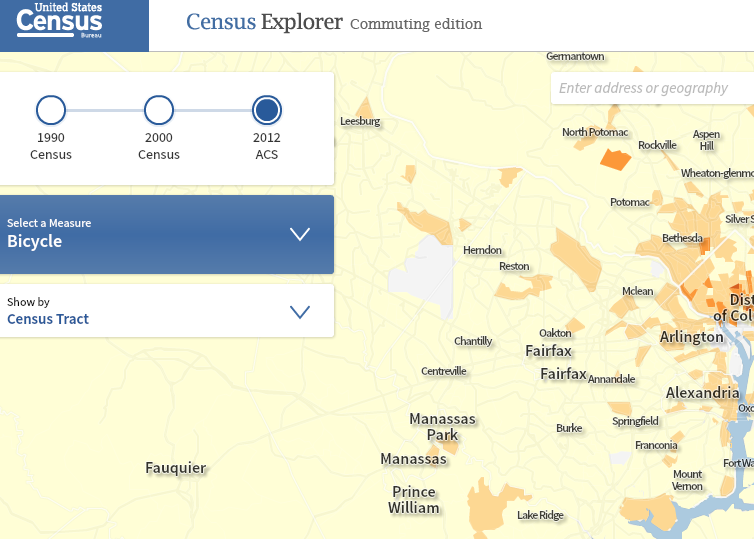 Census tracts in Fairfax County show that areas abutting major facilities such as the W&OD and Mt. Vernon Trails tend to have higher levels of bicycling than the surrounding suburban tracts. VDOT is holding the first Fairfax County I-66 Multimodal project meeting on Thursday, January 29 at the VDOT Northern Virginia District Office, 1st Floor, Occoquan Room, 4975 Alliance Drive, Fairfax, VA 22030 from 6:00 p.m. until 8:30 p.m. Please consider attending one of the I-66 meetings to learn more about the project and voice your support for bike access, or Take Action Now to insist that biking and walking be an integral part of the planned multi-modal improvements to the I-66 corridor. Fairfax County Trails Plan includes a Major Regional Trail along I-66. The Trails Plan is part of Fairfax County's Comprehensive Plan. Bicycle travel is becoming an increasingly important travel mode for both commuter and recreational travel, and is included in the Fairfax County Comprehensive Plan – Transportation Map and the Bicycle Master Plan currently under development. The Washington and Old Dominion Trail (owned and operated by the Northern Virginia Regional Park Authority) serves much of the I-66 corridor inside the Capital Beltway and runs immediately adjacent to the highway in several locations. The trail diverts from I-66 at the Capital Beltway and runs northwest to the Towns of Vienna and Herndon. The provision of a bicycle trail that serves the I-66 corridor outside of the Beltway, which is included in the County’s transportation plan, would provide bicycle accessibility to large portions of Fairfax County and beyond. Furthermore, this trail and/or future extensions of this trail would provide interconnectivity to other bicycle facilities planned in both Fairfax and Prince William Counties and allow for opportunities to provide crossings of I-66 with exclusive bicycle/ pedestrian bridges or underpasses. Long sections of the W&OD Trail are still snow and ice covered in the Reston area. According to NVRPA staff, the recent snowfall amount was not enough to allow them to use their snow blower. It's unfortunate because there is enough snow that it will likely cover sections of the trail for several days. NVRPA did have a crew out clearing snow at some of the intersections. You can see from the first photo below that there's lots of ice and snow from Old Reston Ave toward the east for as far as you can see. You can also see the tire tracks of the NVRPA truck that passed through. 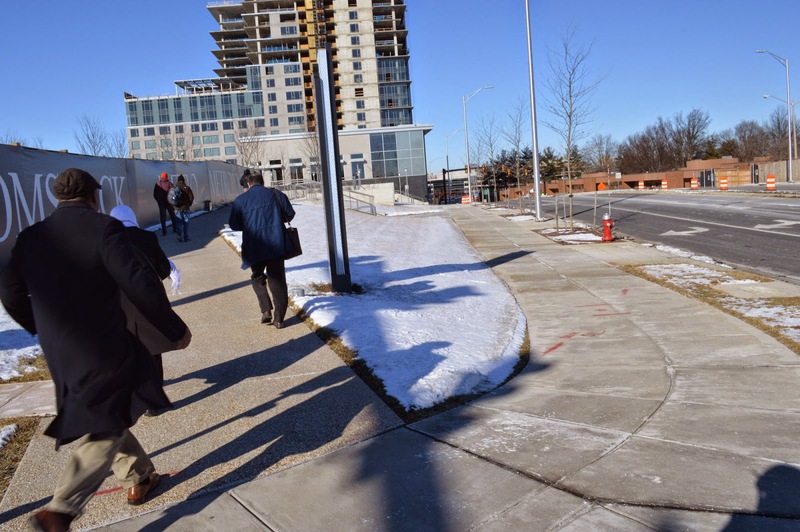 On the other hand, the trail along Wiehle Ave and the sidewalks leading into the Wiehle-Reston East Metro station were clear of snow. 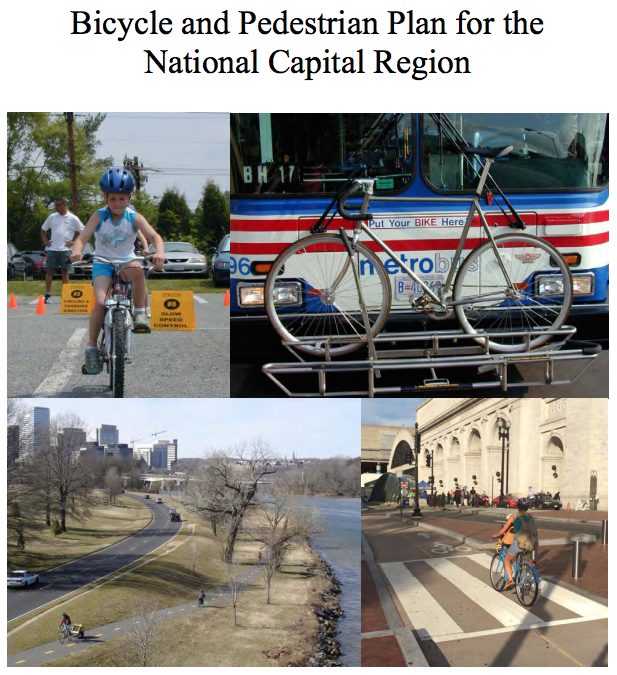 The Metropolitan Washington Council of Governments (MWCOG) has updated and posted its "Bicycle and Pedestrian Plan for the National Capital Region” on the MWCOG website. One of the plan’s key findings was that, based on information from the census bureau’s annual American Community Survey (ACS), the percentage of people who biked to work on an average day in the Washington area doubled from 0.3% to 0.6% over the first decade of the 21st century and, in Fairfax County, the commute by bike mode share went from .14% in 2000 to .3% in 2012. The council, with help from bike coordinators from local and state departments of transportation and civilian advocates on its Bicycle and Pedestrian Subcommittee, has identified major bicycle and pedestrian projects the region wants to complete by 2040 along with “best practices” likely to be effective in achieving those goals. The updated plan includes lots of interesting data points about bicycling in Fairfax County. In addition to mode share (the percentage of travelers or number of trips using a particular type of transportation), the plan discusses trends in policy and safety. For example, Fairfax County is on par with or ahead of most of its neighbors by having 1 Full Time Equivalent (FTE) bicycle planner, 1 FTE pedestrian planner, and 2 FTE trail planners. Similarly, Fairfax County’s full-time, school district-level Safe Routes to School Coordinator keeps it on par with or ahead of most of its neighbors. Fairfax County schools’ participation in Bike to School Day dropped from 35 to 32 schools between 2013 and 2014 but was still the highest in the region. With regard to safety, the updated plan notes that bike injuries in the region have been rising sharply since 2010, driven largely by the increase in bicycling in the District of Columbia. In Fairfax in 2012, there were 9 bike crashes and 10 bike injuries per 100,000 residents. Annual average fatalities for the period of 2011 to 2013 for Fairfax included pedestrians and cyclists and at .77 per 100,000 residents were the second lowest in the region (Fairfax’s estimated 2013 population was 1,130,924). Such fatalities have been declining in Fairfax, dropping from 13 in 2010 to 8 in 2013. Of those, 4 fatalities were bicyclists in 2010 and there were 0 bicyclist fatalities in 2013. Finally, the updated plan includes an appendix that lists and provides basic information on 336 bicycle and pedestrian projects planned for the National Capital Region and 73 projects completed since 2006. According to the council, the planned facilities, if completed, will provide 450 miles of bicycle lanes, 630 miles of shared-used paths and signed bicycle routes, and 20 major pedestrian/bicycle intersection improvement projects. Submitted by Steven Ward, FABB. On January 13 Charlie Strunk, the county's first and so far only bike coordinator, retired. Charlie had a long career with the county. One of his earliest projects was working on the Fairfax County Parkway construction project. He became bike coordinator in 2006 and received the FABB Award of Recognition in 2012. He also received the 2009 Transportation Achievement Award from the Transportation Advisory Commission. Vanessa Aguayo is serving as acting bike coordinator until the position is filled. We've heard that interviews have been conducted and that a coordinator will be hired in the near future. On Charlie's last day with the county the Board of Supervisors renamed the Wiehle-Reston East bike room in his honor and the county will place a plaque there recognizing his accomplishments. Charlie worked hard with the developers of the station, Comstock Partners, to ensure that first-class bike parking was provided. While FABB was supportive, Charlie deserves almost all of credit for making it happen. Congratulations Charlie! In a joint Board Matter with the Board, Supervisor Hudgins said that she is seeking the Board’s endorsement of naming the Wiehle Reston-East Metrorail Station bicycle parking room after Charlie Strunk. He has been the County’s first Bicycle Program Manager and will be retiring from County service today. Supervisor Hudgins referred to her written Board Matter and outlined the history of the County Bicycle Program and Mr. Strunk’s involvement with the program. 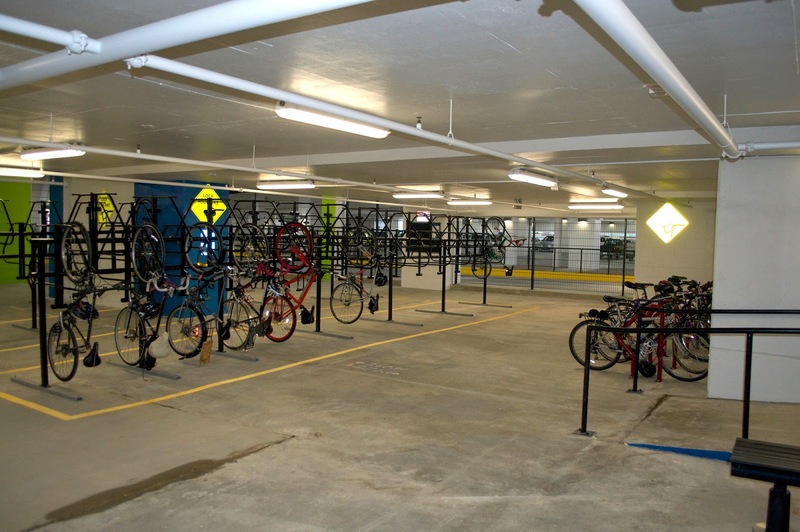 Supervisor Hudgins announced that in 2014, with the opening of the Silver Line, the Department of Transportation (DOT) also opened the Wiehle Reston-East Metrorail Station Bicycle Parking Room. It is the first secure bicycle room in the County. Mr. Strunk led not only the design efforts, but coordinated with other County departments, stakeholders, and advocacy groups to ensure all voices and concerns were heard. The Wiehle Reston-East Bike Room currently has 300 members from all over the region, including Maryland and the District of Columbia. This bike room is a proto type for other rooms being planned at the Stringfellow Park-and-Ride Lot, the Rolling Road VRE Station, Route 1 Transit Center; as well as the Herndon and Innovation Center Metrorail Stations. Chairman Bulova seconded the motion and it carried by unanimous vote. WABA is seeking candidates to serve on their Board of Directors. There is currently no Fairfax County resident on the board. If you are interested, you can submit a notice of interest and explain your background in bicycling, your background in bike advocacy and outreach, your community of influence, your fundraising and development skills and background, etc. FABB is a sponsored project of WABA. WABA is always looking for people with a passion to help make the Washington area a safer and more welcoming environment for people using bikes. To this end, WABA’s Board Nominating Committee is now searching for director candidates with strong leadership skills and experience in helping non-profit organizations execute strategy and development plans. WABA enjoys a solid foundation of loyal members and a dedicated funding base. However, we have a particular interest in candidates who can help us further expand our partnerships with a broader pool of private organizations and individuals who share and will support WABA’s goal of making the Washington area the most bicycle friendly in the world. Direct experience with membership development, institutional giving, and major gifts a plus. WABA board members are volunteers who serve two year terms and are expected to participate in regularly scheduled board meetings, provide counsel to WABA staff in their areas of expertise, and make WABA a significant part of their individual philanthropy. Candidates who are interested in exploring whether their skills and interests align with WABA’s are invited to make an initial expression of interest by filling out the form. If you have previously filled out an expression of interest, and remain interested, please email me at mark@waba.org. While the search for director candidates is an ongoing one, the board expects to present a slate of candidates at the February 20 annual meeting. The Virginia Department of Transportation's I-66 Public Information Meeting that was scheduled for tonight, Tuesday, January 27, 2015, has been cancelled due to inclement weather. 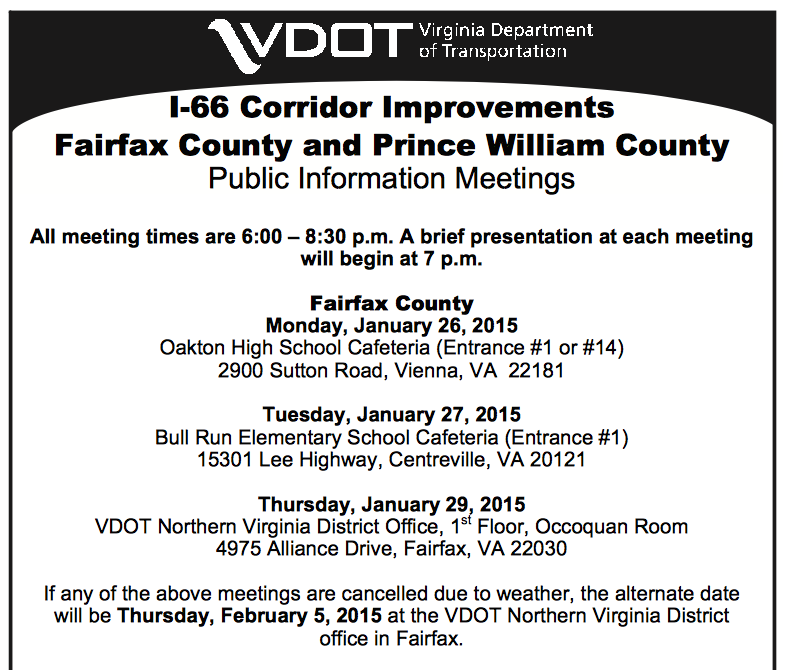 Thursday, January 29, 2015, at the VDOT Northern Virginia District Office in Fairfax from 6:00 p.m. until 8:30 p.m. If you cannot attend in person, the meeting on Thursday, January 29, 2015, will be shown live at Transform66.org between 7:00 p.m. and 8:00 p.m.
Tuesday, February 3, 2015, at Oakton High School in Vienna from 6:00 p.m. until 8:30 p.m.
Thursday, February 5, 2015, at the VDOT Northern Virginia District Office in Fairfax from 6:00 p.m. until 8:30 p.m. Please visit the project website at Transform66.org for more information. U.S. Department of Transportation Secretary Anthony Foxx recently announced a campaign to improve bicycle and pedestrian safety, Mayor’s Challenge for Safer People and Safer Streets. As part of the campaign Secretary Foxx "invites Mayor’s and local elected officials to attend a Safer People, Safer Streets Summit and then take significant action over the next year to improve pedestrian and bicycle transportation safety. The Mayor’s Challenge will showcase effective local actions to improve safety, empower local leaders to take action, and promote partnerships to advance pedestrian and bicycle safety." The seven Challenge activities are drawn from the recommended actions stated in the2010 USDOT Policy Statement on Bicycle and Pedestrian Accommodation Regulations and Recommendations. For example, recommended actions in the policy statement include gathering and tracking data on biking and walking in their community and ensuring street designs are appropriate for pedestrian and bicycle safety. Attendees at the Summit will work with USDOT staff to identify new Departmental resources they can use during the Challenge and will network with their peers. Due to inclement weather, the Virginia Department of Transportation (VDOT) has cancelled the I-66 Public Information Meeting that was scheduled for tonight, Monday, January 26, 2015. The meeting has been rescheduled for Tuesday, February 3, 2015, at Oakton High School from 6:00 p.m. until 8:30 p.m.
Read about the I-66 project in Tolls proposed for I-66 solo commuters, an article in Sunday's Washington Post. As we've mentioned earlier, VDOT is holding meetings this week to allow residents to provide feedback on the project. We're asking cyclists to attend to ask for an extension of the Custis Trail outside the Beltway, and for safe bicycle facilities on the bridges over I-66 that will be rebuilt as part of the project. According to the article, "Improvements to pedestrian and bicycle networks in the corridor are also part of VDOT’s multi-modal push for dealing with congestion." Now is the time to find out what improvements are planned and to ensure we don't lose a once in a generation opportunity to make the I-66 corridor more bike-friendly. In the same article it's noted that DC is proposing to "add 10 dedicated bike lanes to its network" at a cost of $470,000. Biking has become an increasingly popular way to get around the District. As of 2013, about 4.5 percent of the District’s population commuted to work via bike, according to figures from the U.S. Census Bureau. The creation of Capital Bikeshare, which celebrated its fourth year in 2014, has also boosted the popularity of biking in the city. Capital Bikeshare is hosting an open house Wednesday to talk about expansion plans and a proposed rate hike. Your help is needed to ensure that safe and accessible bicycle and pedestrian facilities are included as part of a significant construction project planned for the I-66 corridor outside the Beltway. These facilities should include a grade-separated trail parallel to I-66 that would be an extension of the Custis Trail and bike facilities on bridges across I-66 when they are rebuilt. Please consider attending one of the upcoming public meetings January 26, 27, and 29 to learn more about the project and voice your support for bike access, or Take Action Now to insist that biking and walking be an integral part of the planned multi-modal improvements to the I-66 corridor. If you cannot attend one of the upcoming public meetings listed below, please take a moment to submit your comments to VDOT using the form hosted by WABA. Please also write to your Fairfax County Supervisor and your Virginia Delegate and Senator. This project will have huge impacts on the region so let's make sure we do it right! At their January 22 meeting the Fairfax Co Planning Commission recommended adoption of the proposed Lake Anne redevelopment that has been in the works for many years. The project includes extensive bicycle accommodations, including bike lanes on the uphill sections of North Shore Drive and sharrows on the downhill sections, short and long term bike parking with signage noting that bike parking is available, and space for three bike share stations. 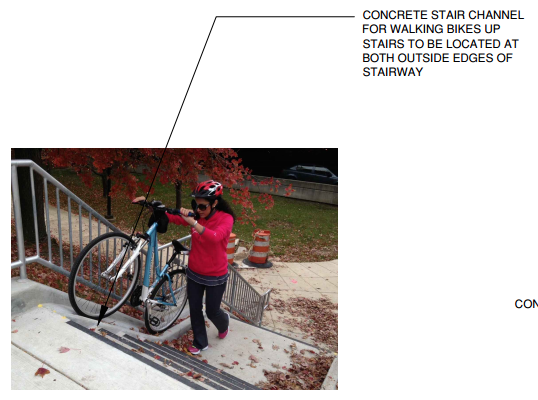 Stairs leading to the plazas will have stair channels for walking a bicycle up/down the stairs. See the staff report for details and other info about the proposal. While we support the project, we are concerned that the bike parking requirements for multi-family residences are minimal; one long-term bicycle parking space for every 10 units. Arlington requires one parking space for every 3 units. Most households own at least one bicycle and one space for every 10 units is not enough. When the county bicycle parking guidelines come before the Board of Supervisors in the near future we plan to advocate for more robust requirements. public, if any. The bicycle racks shall be inverted U style racks, or of such other design approved by FCDOT. Bicycle facilities shall be installed prior to the issuance of the first RUP or Non-RUP for such use in accordance with the site plan on which the applicable bike facilities are shown. A. Office Bicycle Parking. The Applicant shall provide one (1) long-term bicycle parking space for every 10,000 square feet, or portion thereof, of office GFA and one (1) short-term bicycle parking space for each 20,000 square feet, or portion thereof, of office GFA. B. Multi-family Residential Bicycle Parking. The Applicant shall provide one (1) long-term bicycle parking space for every 10 multi-family residential units and one (1) short-term bicycle parking space per every 50 multi-family residential units. C. Retail Bicycle Parking. The Applicant shall provide one (1) long-term employee bicycle space for every 25,000 square feet of retail GFA and one (1) short-term bicycle parking space for every 10,000 square feet of retail GFA. 48. On Road Bicycle Facilities. The Applicant shall provide on-road bicycle facilities along North Shore Drive as shown on the Plan and as coordinated with both VDOT and FCDOT at time of the first site plan for Buildings A1 or A2 within the curb to curb width and in accordance with the following. B. Along the north side of North Shore Drive, a sharrow will be provided from Cameron Crescent Drive west to Village Drive. 49. Bike Share. The Applicant has designated three (3) areas within the Application Property (one on the East Side and two on the West Side) and as reflected on the Plan for use as future bike share stations by others. Such spaces shall be made available upon request of the County at no cost to the operator of such service. If a bike share service has not requested the use of the areas after Stabilization of the East or West sides as defined herein, respectively, this proffer obligation shall become null and void and of no further force and effect. Del. Manoli Loupassi from the Fan District did a nice job of patroning (Highway Maintenance Bill) HB 1402 (into which Del. Betsy Carr’s similar HB1501 had been combined) This bill would provide that the Jurisdictions that do their own Highway Maintenance rather than having VDOT do it for them (City of Richmond, Henrico county, and Town of Ashland are in this category) do not lose their maintenance reimbursement if they convert highway “lane miles” to bike lanes, as is now the case. This is a fairly big deal since the current reimbursement practice has been a big dis-incentive for the installation of bike lanes in those jurisdictions). After some discussion, and some mild dissent from Del. Randy Minchew of Leesburg, the bill was REPORTED by a 6-1 vote, with only Minchew voting against, and now goes on to the full Trans Comm, probably on Tuesday morning at 8:30. Last of all was Del. Carr with her (Highway Maintenance Bill - Paved Trails) HB1502, which would give the City of Richmond maintenance reimbursement at 1/2 that of highway mileage for that portion of the Capital Trail which was (and will be) built by VDOT in the City but will be the City’s to maintain (unlike the rest of the Trail, which was built by VDOT and will be maintained by them). With little sentiment by the panel members for helping the City in this way, the bill was TABLED by a 7-0 vote. I had hoped to get up to the House Militia, Police and Public Safety SubComm meeting to support Del. Rich Anderson’s HB1926 restricting the use of Cell Phones by drivers which started at 7:30. After the meeting, I learned that HB 1926 had been TABLED on a voice vote, which will be a big disappointment to the Drive Smart people and the others working to reduce Distracted Driving, who had some hopes of getting it through. With that result, I don’t hold any hope for Sen. Wexton’s similar, but a little more strict SB1279, which will be heard next week. Meanwhile, HB1342, the Following Too Closely bill got its 2nd reading today on the House Floor and probably will get voted on Tomorrow. If you haven’t done so, it’s not too late to contact YOUR Delegate and ask them to support it. I think its in good shape, but nothing is certain until the vote is tallied, so your contact will be a big help. Sen. Reeves’ Following too Closely Senate bill for some reason was Passed by until next week, which is not critical since Del. DeSteph’s identical bill is moving right along in the House. All the other bills were handled before the main event of the afternoon, which was the bill pitting the Taxicabs against UBER, which I did not hang around to observe. Sen. Wexton’s Cell phone restriction bill was Passed by for the day, so Del. Anderson’s similar House bill will go first, at 7:30 tomorrow morning in Militia, Police, & Public Safety, and Champe and I will be there for it, as well as for the three reimbursement for Maintenance bills, which will be at 7 a.m. in House Trans Sub 4. Also, it is very timely for everyone to contact their Delegates in Support of HB1342, Del. DeSteph’s Don’t Follow Too Closely bill, which got its first reading on the House floor today, and probably will get its final floor vote by Friday, as this Short Session moves right along. We support all except one, the mandatory sidepath bill, which of course we oppose. Some of these bills are identical, or nearly so. As they move forward, they are typically “conformed” into a single bill. SB781, SB1027 and SB1228 would allow drivers to cross the double yellow line to pass vehicles traveling at 25 MPH or less. Most drivers already do this to pass postal jeeps, street sweepers, farm vehicles and lawnmowing equipment. Making this clearly legal would let drivers feel free to pass people on bikes with at least the 3′ minimum clearance now required by law, and eliminate the most common excuse for not doing so. We support these bills. HB1402 would preserve maintenance funding based on lane-miles, when regular travel lanes are converted to bike lanes. Concern about loss of lane-mile funding keeps many municipalities from implementing road diets, creating bike lanes and improving safety for all road users. We support this bill. HB1502 would allow cities to receive maintenance funds for VDOT-constructed paved trails at 50% of the rate allowed for collector roads and local streets. We support this bill. SB882 would make it it illegal to open a traffic-side car door into the path of a cyclist, punishable by $100 fine. It would also make it easier for cyclists to be fairly compensated after being injured by carelessly opened car doors. We support this bill. HB1926 and SB1279 would ban use of any personal communications device while driving, unless that device is hands-free or the vehicle is stopped. We support this bill. HB2159 would require motorists to stop for pedestrians crossing highways at marked crosswalks (current language says “yield”). We support this bill. HB1746 would require people on bikes to use any available sidepath or bike lane, and prohibit their riding in the roadway. Naturally we oppose this bill. VDOT and the Department of Rail and Public Transportation (DRPT) are planning a massive construction project to add HOV lanes to I-66 outside the Beltway. According to the I-66 Corridor Improvements page, the project is meant to "transform 25 miles of I-66 into a multimodal facility that moves traffic and people more efficiently, with improvements such as express lanes, rapid bus service and a park-and-ride network from the Capital Beltway to Haymarket." There is a noticeable lack of any mention of bicycling and walking in their definition of "multimodal." This project is moving quickly, with strong support from Governor McAuliffe. If HOV lanes are added, every bridge crossing I-66 between the Beltway and Haymarket will be rebuilt. This is an ideal time to add a grade-separated, multiuse trail, parallel to I-66, similar to the Custis Trail. The merged Custis Trail/W&OD Trail inside the Beltway splits from I-66 at the Beltway. Having a wide, paved trail would allow for many short trips in the highly developed I-66 corridor outside the Beltway to be taken by bike and on foot, and would provide a tremendous recreational asset as well. Public meetings are planned later this month to provide information about the project and to solicit feedback from residents. Cyclists need to be present at these meetings to speak out for making the I-66 corridor truly multimodal. Collecting better active transportation data is essential to building long-term support for walking and cycling, and for improving conditions for those who choose to walk and ride bikes. The County currently has 32 permanent installations, and six portable counters to gauge and monitor usage and demand. Fairfax County recently unsuccessfully applied for a grant to install Eco-Counters in the Springfield area. FABB is working on getting funding for a counter that would be donated to the county. Stay tuned. A recent blog post on BikePortland discusses how federal traffic forecasters have finally modified future traffic estimates that reflect the decline in driving nationwide: After a decade of less driving, federal forecast shifts to match reality. Traffic forecasts are important since they are used by state and local transportation departments to justify massive road projects, and to reject bike projects. (by year reports are dated). For travel forecasters around the country, it’s been a very confusing decade, probably best summed up by this chart showing year after year of incorrect traffic projections from USDOT’s annual Conditions and Performance report, which aggregates projections from metro areas around the country. 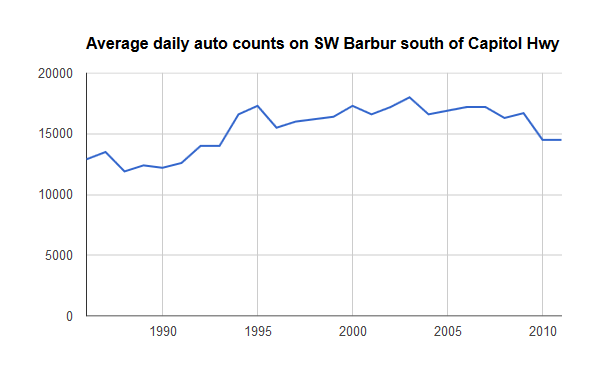 How much traffic will increase is a debate that affects us in very practical ways here in Portland, where (for example) the Oregon Department of Transportation has cited future traffic increases as a reason not to improve bike lanes on Southwest Barbur even though its own data shows that auto traffic on Barbur peaked in 2003. Andy Cotugno, the transportation planning director for regional planning agency Metro, said Wednesday that his organization won’t be affected by the federal change, in part because his team’s projections already reflect the plateau in miles driven per person. “We’ve scaled our transportation plans down to be more realistic,” said Cotugno. Cotugno often circulates a chart showing that in the Portland metro area, driving rates per person peaked in 1996, eight years before they did the same nationally. But Cotugno said he worries that state DOTs and other agencies are too eager to circulate overestimates for future travel demand as a way to justify the need for more money. The woman who killed Thomas Palermo in Baltimore, Bishop Heather Cook, has been charged with manslaughter. Ms. Cook left the scene of the crash and returned some time later. It was disclosed today that she had a blood alcohol level of .22, almost triple the legal limit in Maryland of .08. She was also texting when the crash occurred. Episcopal Bishop Heather Cook will be charged with manslaughter in the fatal crash that killed cyclist Thomas Palermo, Baltimore State's Attorney Marilyn J. Mosby announced Friday morning. Cook will face charges of leaving the scene of a fatal accident; driving under the influence and causing an accident due to texting while driving. Both the manslaughter and leaving the scene charge carry a maximum sentence of 10 years imprisonment. A warrant will be issued for Cook's arrest, prosecutors said. "The driver of a motor vehicle shall not follow another motor vehicle, trailer, or semitrailer more closely than is reasonable and prudent, having due regard to the speed of both vehicles and the traffic on, and conditions of, the highway at the time." "Payments made to affected localities shall be based on the number of moving-lane-miles of highways or portions thereof available to peak-hour traffic in that locality. Moving-lane-miles of highway that are converted to two-way bicycle travel lanes shall continue to be included as moving-lane-miles of highway for purposes of calculating payments under this section." SB781 - Passing with a double yellow line; drivers allowed to pass a bicyclist - This bill will allow motorists to pass a bicyclist by crossing a double yellow line where it is safe to do so. 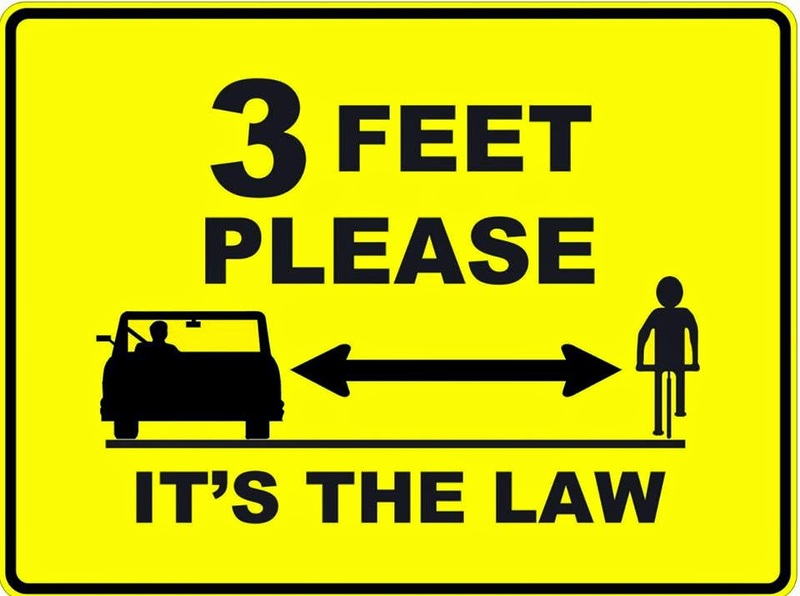 Motorists would be able to allow 3 feet when passing a bicyclist even though it means crossing the double yellow line. Many motorists currently do this but with passage of the bill that behavior will become legal. Here is the modified text from the bill. "Wherever a highway is marked with double traffic lines consisting of two immediately adjacent solid yellow lines, no vehicle shall be driven to the left of such lines, except (i) when turning left or (ii) in order to pass a pedestrian, a device moved by human power, a stopped vehicle, or a vehicle moving at less than 25 miles per hour in the same lane, provided such movement can be made safely;"
See VBF's Allen Muchnick's statement for the Manassas-area delegation Public Hearing for the 2015 Legislative Session that was held January 8, 2015. It provides addition information about these bills. On Saturday the entire Fairfax delegation will hold a hearing starting at 9 a.m. at the Fairfax County Government Center. Cyclists are encouraged to attend that hearing and testify in support of these bills. 2014 was a banner year for bicycling in Fairfax County. The county adopted their first-ever bicycle master plan which will guide the development of bicycle facilities, programs, and policies for the next 10-20 years. Below is a summary of major bike-related events during the past year. 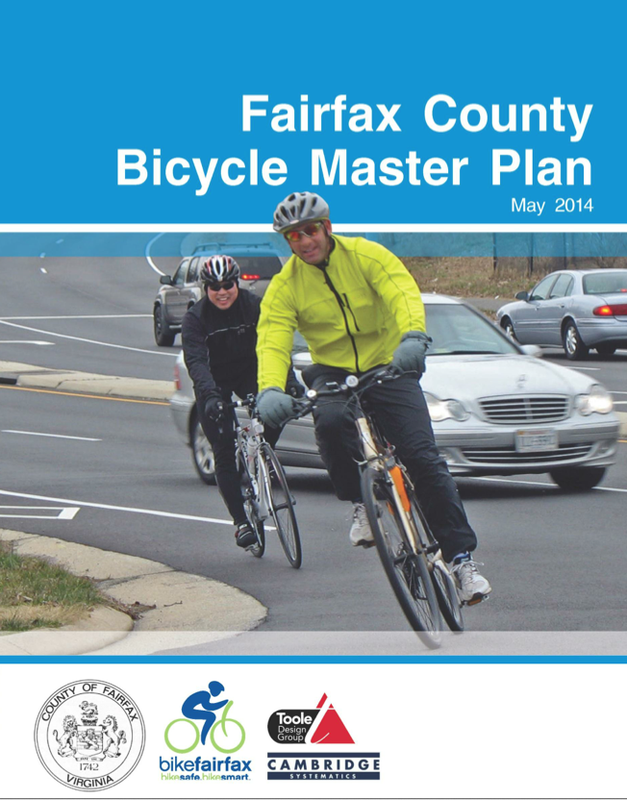 At their October 28 meeting the Fairfax County Board of Supervisors unanimously adopted the county's first-ever bicycle master plan. The plan is now officially incorporated into the Transportation component of the Comprehensive Plan. This is a major accomplishment for FABB and will guide development of bicycling in the county for the next 10-20 years. See our coverage of the bicycle master plan approval process. For the first time in many years the Board of Supervisors committed to spending $204 million over the next six years for pedestrian and bicycle projects of which about $40 million is for bike projects. While specific funding sources have not been identified for all projects, the Board is committed to finding those funds. The major bike-related projects included on the list are: Old Keene Mill Road Bike Shoulders ($9 million), Route 236 Corridor Improvements (bike lanes, wide curb lanes, bike shoulders, $7.5 million), Scotts Run Stream Valley Trail ($3 million), Cinderbed Road Bikeway ($4 million), Mount Vernon Memorial Highway (Potomac Heritage National Scenic Trail) ($6.5 million), Mason Neck Trail ($5 million), and improvements to Holmes Run Stream Valley Trail ($1.5 million). In November 72% of Fairfax voters agreed to fund $100 million in pedestrian, bicycle, and some road projects. While only 6% of those funds were earmarked for bicycle projects, cyclists will likely also use many of the pedestrian projects. In July the five Fairfax Silver Line stations opened along with the county's first secure bike room at Wiehle station. Biking to the Wiehle and McLean stations was popular from the start, with free parking at the Wiehle station filling during the first week and the McLean station racks also heavily used. WMATA placed additional bike parking at the McLean station. 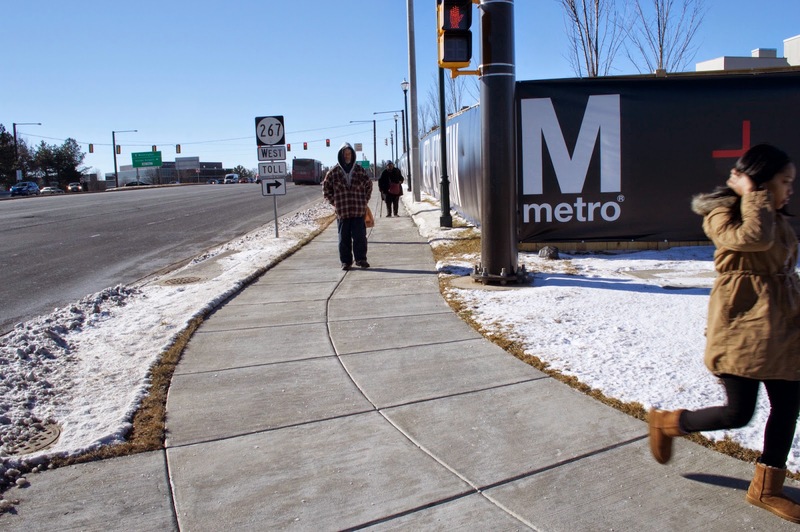 Metro service along the Dulles corridor is having a major impact on redevelopment and on how residents get around. See FABB's Bicycling and the Silver Line page for links to bike routes to the stations. 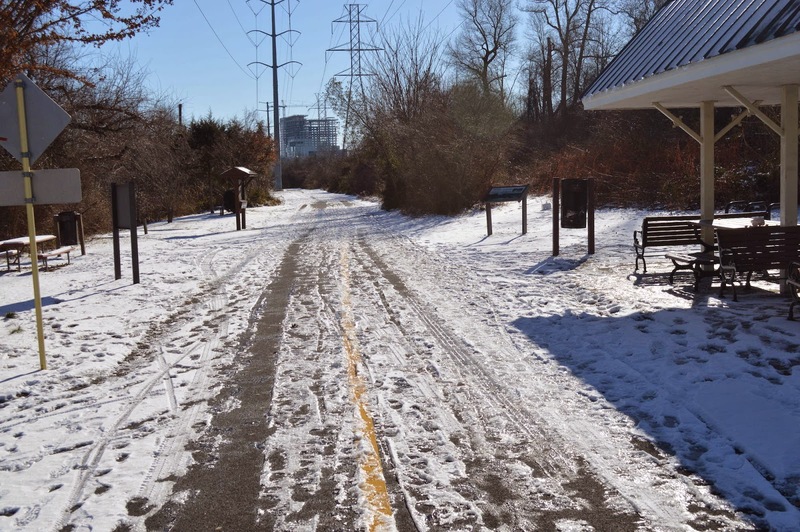 For the first time, NVRPA cleared snow on major sections of the W&OD Trail. In other W&OD trail news, NVRPA released a W&OD Trail safety report in June. NVRPA also completed a connector trail from the W&OD Trail to Meadowlark Gardens Botanical Park. For the first time that we're aware of VDOT devoted extensive resources to repairing the Fairfax County Parkway Trail. FABB has advocated for repaving of the trail for several years. While only portions of the trail are being repaved, the entire length of the trail has been evaluated by VDOT and repaving and repairs are being made as needed. VDOT also installed wayfinding signage on the Parkway trail detour in the Fair Oaks area. 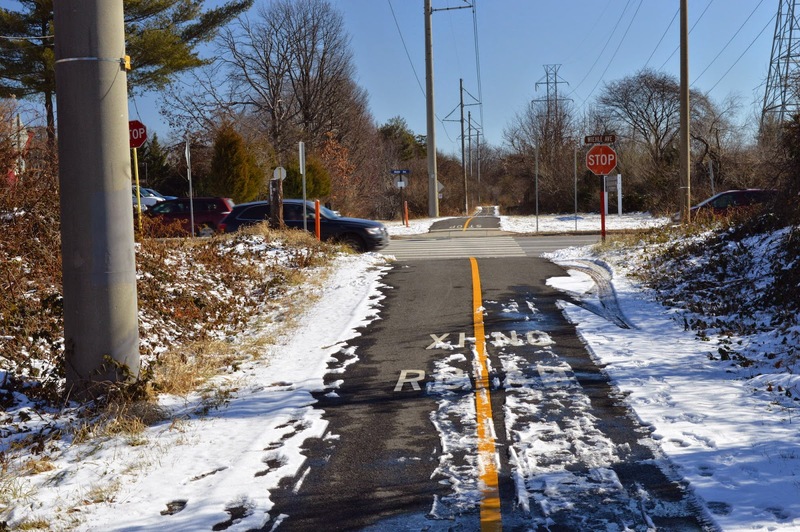 In other trail repair news, Fairfax County completed repairs of the Ashgrove Trail, a bicycle connection to the Spring Hill Silver Line station. If you know where other trail safety improvements are needed, use the new Pedestrian Safety Improvement Request Tool to identify them. The Route 7 bridge over the Dulles Toll Road will be replaced and the current design includes trails on each side of the road with ramp crossings that are separated from high speed traffic. FABB and other potential trail users advocated for this design from the early stages of the project. We are also advocating for a similar treatment for the proposed trail along Route 123 under the Beltway. After several failed attempts, the three foot passing bill was approved by the VA Senate and House by wide margins. The law went into effect on July 1. Several other bicycle-related bills failed. VBF's 2015 legislative agenda has not yet been made public. As part of the repaving of Sherwood Hall Lane and Courthouse Road, VDOT reconfigured the road to reduce some on-street parking and add bike lanes along most of Sherwood Hall Lane between Fort Hunt Rd and Route 1 and on Courthouse Rd in Vienna from Route 123 to Nottoway Park. Cyclists spoke out in support of the Sherwood Hall Lane project which was approved despite some local opposition. When bicyclists attend meetings and show their support it makes a difference. According to the Reston Bike Share Feasibility Study, a bike sharing system is feasible in Reston, implemented in two phases. Phase 1 would consist of 13 stations with 130 bikes, with all but one station located north of the Toll Road. Most proposed stations would be located in the Town Center area. The station locations were determined based primarily on potential demand and the desire to reduce the space between stations. The county received $400,000 from MWCOG to begin implementing the system. The primary bicycle route through Ft. Belvoir, Woodlawn Road, was closed after 9/11. Since that time bicycle access through the facility has been difficult. With the opening of Jeff Todd Way/Mulligan Road, bike access has been restored. Bike to School Day continues to grow in Fairfax, especially in Vienna and Reston. A Safe Routes to School Workshop was led by Mark Fenton, nationally known expert on public health and active transportation. Mark also was the featured speaker at the county's Healthy Communities by Design Summit. WABA published the Route 50/Arlington Blvd Trail Concept Plan which outlines the creation of a connected bike trail along Route 50 from Arlington to Fairfax City.